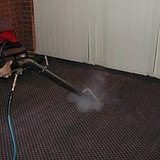 Able Carpet Care(est 1956) has been using the Cleanco Truckmount technology for over 4 years. Less chemicals to clean carpet, upholstery, curtains in commercial or domestic cleaning jobs due to better heat, chemistry and 50+ years of knowledge. Professionally cleaned Carpet - Upholstery - Curtains improves your indoor health for you and your family, extends the life of the fiber and we extract more water than other machines, reducing the drying time.